I have a soft spot in my heart and soul for Mercury Glass. There is just something so elegant about that shiny glass but you can also use it with other textures throughout the house. 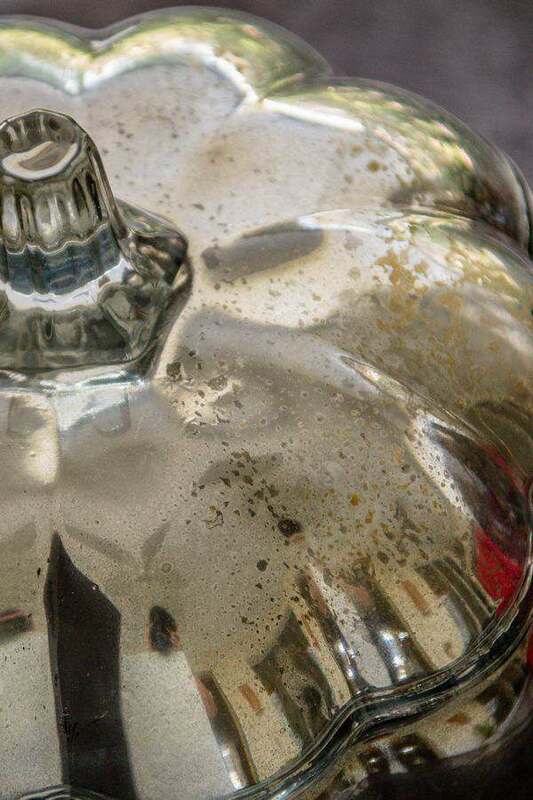 For decorating, I love to use mercury glass for the holidays. But, it can be very pricey. I was so happy when I found out I could make my own knockoff version of mercury glass. Mercury glass (or silvered glass) is glass that was blown double walled, then silvered between the layers with a liquid silvering solution, and sealed. Although mercury was originally used to provide the reflective coating for mirrors, elemental mercury was never used to create tableware. 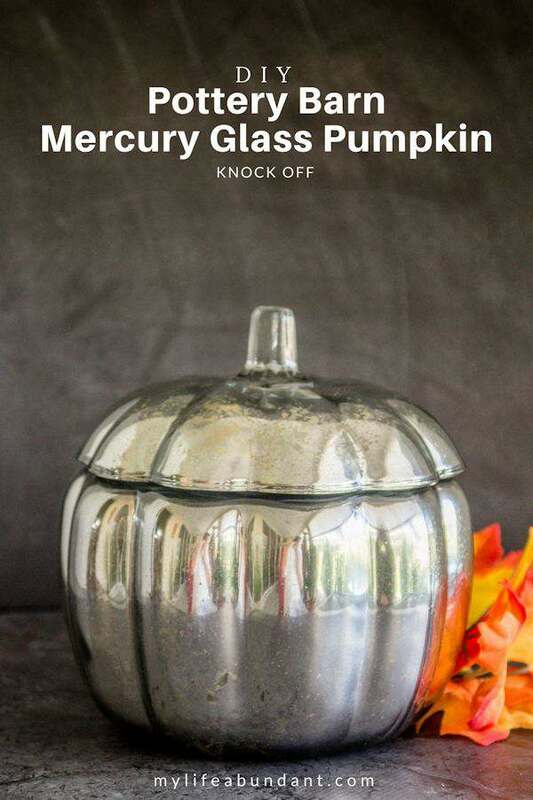 The last time I priced a mercury glass pumpkin it was ranging around $50! I love the stuff, but I just can’t see myself spending that much for a glass pumpkin. But there is a way I could satisfy my addiction to these beautiful mirrored items and not go broke in the process. I can make my own that looks so close to the real thing, no one will ever know you made it yourself. Let me show you how. The only place I have been able to find the Krylon mirror paint is at Hobby Lobby. It never goes on sale, so take one of their 40% coupons to make it less than $7.00. I’ve noticed that Krylon now has a product called Krylon Looking Glass Mirror Paint. The can has a different lable, but it could be the same product. I did see that product at Walmart. Make sure the glass pumpkin has been washed and dried with no spots. I taped around the outside edges of the bottom and top of the pumpkin so no spray wouldn’t land on the outside. You will be painting the INSIDE of the pumpkin. 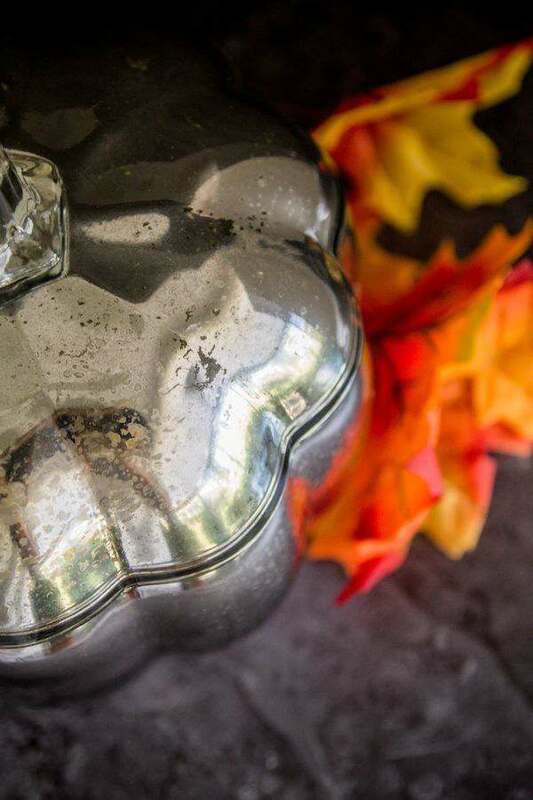 Take your spray bottle of water and lightly spray the inside of the bottom of the pumpkin. You don’t want runs of water. Just some light spraying. It won’t matter if you only spray in some areas. Inconsistency is key to this project. You don’t want it to look perfect. Then lightly spray the paint inside. And I mean really lightly spray. If you spray a thick layer, it will run. It should look like the picture above. The water will keep the spray from adhering to the glass. I then take my blow dryer and dry the paint for just a bit. You don’t want the water to dry. I will then do another coat of spray paint. Blow dry again. Sometimes it may take 3 or 4 layers of paint to get the look you want. Keep checking the outside of the bowl to see how it looks. If the water dries, just spray a light coat again. This is what the inside of the lid looks like after it has dried. You can see the dots of areas where the water was. The longer it dries, when you are done, the shinier it will become. 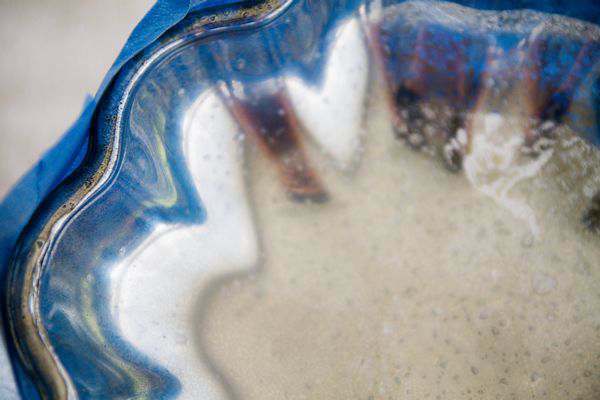 On the outside, you can see the “distressed” look of the spots and that’s what makes mercury glass so special. 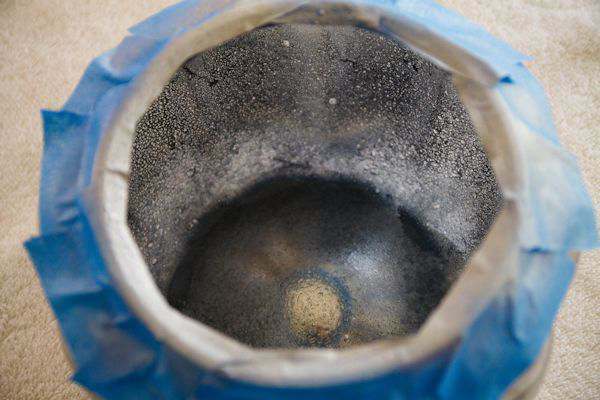 I also blotted some gold paint in a couple areas on the inside of the lid where some of the larger spots where. I love that extra color it added. That small amount of gold made the bowl look more realistically antique. Another view of the pumpkin where you can see where the water spots where. I also did this process with a small glass Christmas tree I had and I love how that turned out.These pumpkins are just beautiful to set out on a dining room table. There are different sizes of these glass pumpkins and would make such a beautiful setting. 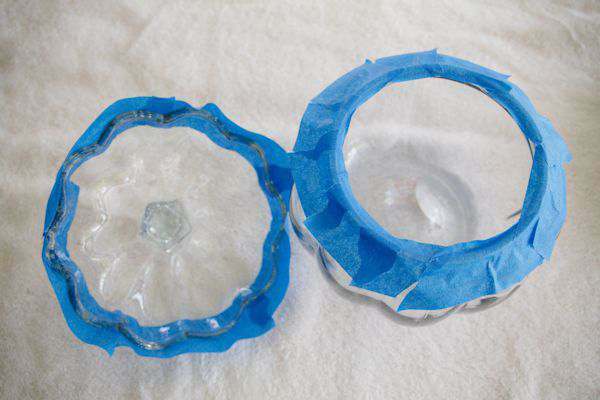 You can also do this process with glass ball ornaments. After I was done with spraying the ball, I put a glittered monogram on the outside of the ball. So cute! I have used this paint of a couple of things and I love it! But I had not thought about using it on pumpkins! Great job. Oh Nikki. You must try using it this way. It turns out so beautifully! I love this project. 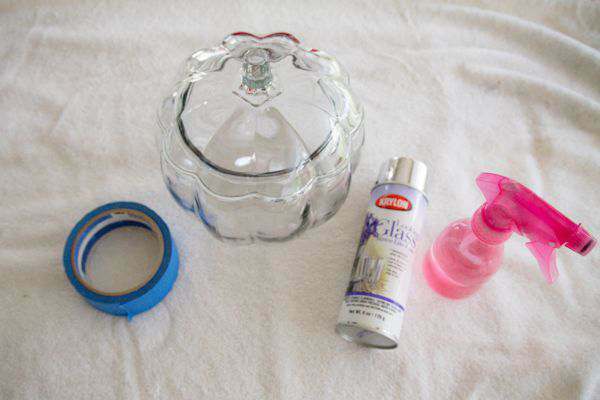 It saves mobey, something you do yourself and can give a second life to a piece of decor. I am all about buying inexpensive craft supplies from the Dollar Tree! 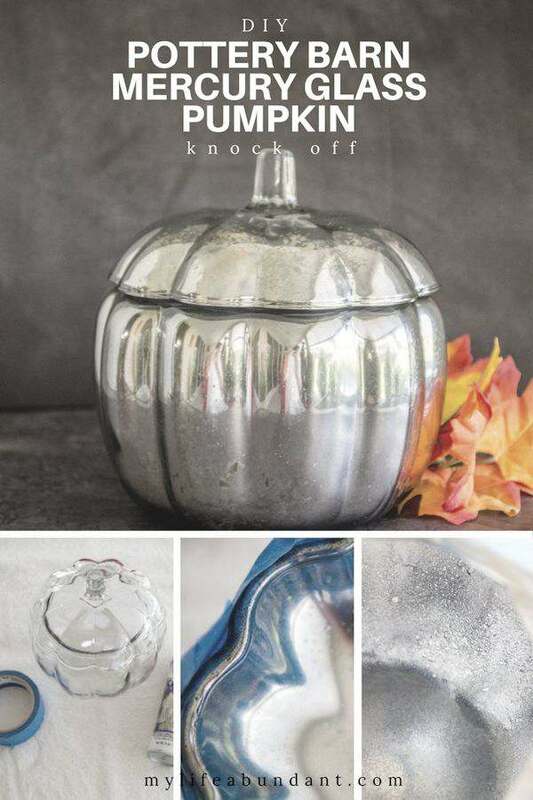 Your mercury glass pumpkin turned out awesome! I will try this craft! It’s more fun and cheaper than buying the antique ones I found. I may be living under a rock but Iwas so amazed at how you turned the glass pumpkin into the finished product! Well done. I have never seen that before! I love anything that is something that you can make yourself at home. This looks like something I could do! Wow! this is too cute and easy to do. I am going to give it try this weekend. That is such a beautiful DIY project and it came out nice. I want to try to do something like this. Very cool! This is SO clever! It looks so great too! I think I’m going to need a few of these for Thanksgiving! Love how this pumpkin turned out. So beautiful and you can do it yourself. Hope you stop by Thursday Favorite Things because you are being featured. Very cute! I’ve always admired mercury glass-style decor. Thanks for the tutorial and thanks so much for sharing at the #happynowlinkup! I love this, Tammy! I was so happy to see you featured at the Happy Now linkup. I had to come over and tell you how cute this is :). Pinned! Hi Candace. I love that DIY. Fun and easy. Thanks for letting me know about the feature.